Besides being nestled perfectly between the ski touring Mecca of Rogers Pass and the vast ski mountaineering potential of the Rockies, Golden boasts a wealth of backcountry skiing in the Dogtooth Range of the Purcell Mountains. From mellow glade skiing to burly alpine couloirs, committed slide paths and hidden pillow stashes, the ridges surrounding Kicking Horse Mountain Resort have it all – including an optional bump to over 2300m via the gondola. Those looking for some extra vertical can enquire with ski patrol as to the best way to ascend the ski hill. Despite the ease of access, the backcountry terrain and snowpack surrounding the resort is extremely serious. 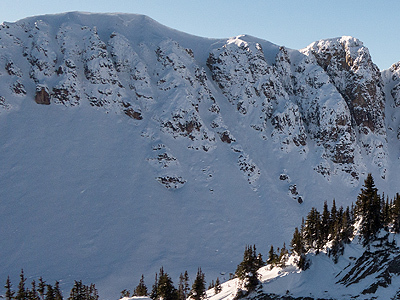 Be sure to consult the avalanche forecast before setting out and beware of steep slopes and overhead hazard. Terrain exists to suit all conditions, however and when stability allows, the skiing in the alpine is truly world class. A few popular routes to the north of the resort have been included here, but options are limited only by fitness and imagination. Skiable terrain stretches in all directions, and your choices even include multi day traverses in the vast terrain to the west. 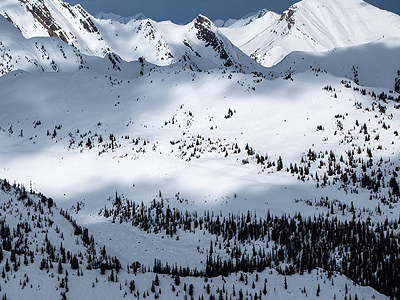 Reudi's Ridge South is a Kicking Horse classic. This sparsely treed, planar slope seems designed for skiing and, though short provides excellent turns even when avalanche conditions preclude nearly every other option. Simply known to most as 'Reudi's', this run has been the introduction to backcountry skiing for many a local. Popular as it may be, to the uninitiated accessing this gem can be a little tricky. Due to tenure agreements with a local heli skiing operator, a narrow permanent closure runs the length of Feuz bowl on the northern edge of the resort. This closure can be enforced by patrol, and blocks access to the simple traverse which would bring one to the base of the run. The approved access begins at G7 Corner, which is the intersection of the Feuz Ski Out, It's a Ten and the very top of Blaster. Here, a sign on the ropeline warns of backcountry hazards. Transition and switchback up a prominent gully, keeping the closed area rope line on your left. 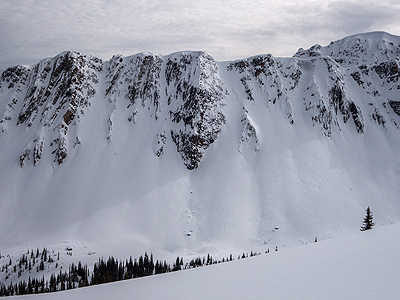 Keep an eye out for skiers descending from the various backcountry runs in the bowl above. Eventually, a final short gully spits you out into a very noticeable, flat clearing with a spectacular view of the Reudi's Bowl Headwall straight ahead. Reudi's Ridge is visible to climber's right. From here, a number of options exist to gain the ridge, some better than others. The only route finding challenge lies in the initial steep trees, which often sport a couple of unnecessarily steep switchbacks. If you find yourself setting a skin track here, take care to keep the grades reasonable. Once at the ridge, follow it until prayer flags marking the summit are reached. Watch out for cornices. Ski back down in the general direction from which you came. The mellowest options lie in the trees to skier's left, while avalanche hazard increases as the slope opens up and steepens to skier's right. For full value, several laps are recommended. A second access option exists via much steeper terrain on Ozone, if conditions allow. Simply finish your run from Ozone at the clearing and follow the standard route from there. An uptrack directly from the bottom of Ozone is also possible, but more exposed. The Mr. Hyde to Reudi's Ridge South's Dr. Jekyll, Reudi's North sports a number of steep chutes and couloirs reminiscent of Ozone. Access is identical to Reudi's South and options exist to suit every (advanced) taste – from broad gullies at the skier's right end to pencil thin rappel access couloirs near the summit, plus everything in between. It can be reasonably easy to see if a line goes from the top, however some can be deceiving so a thorough look from all available angles is highly recommended. Many lines are guarded by large cornices for much of the season. Trundling them can serve as an excellent stability test and is often necessary to enter less popular lines safely. Once at the bottom, keep an eye out for overhead hazard. Exit via the obvious gully, which meets a flagged traverse back to the resort at approximately 1450m. Don't let the easy access fool you – Ozone consists of nothing but serious lines. Be sure of stability and your line choice before dropping in. Several chutes contain mandatory airs and commonly contain innocent looking tracks. Consider scoping your line from Reudi's Ridge South, as none of the skiing on Ozone can be viewed from inside the resort. From the top of the Stairway To Heaven chair, climb the staircase to Whitewall and traverse the ridge to the resort boundary. Boot pack or skin along the ridge line to the prominent summit, respecting the well marked permanent avalanche closure to your right. Once at the summit, beware of cornices, which can be extremely large and extend much further back than they appear. A number of steep and frequently deep chutes await your tracks, all of which funnel into Reudi's Bowl adjacent to the ski area.